My Parisian boss was around last week so we went for a very French 3 hours lunch at Hillstone near Government Center. I had the Pine Ridge Chenin-Blanc/Viognier blend a while ago and I liked it so I decided to try the “Dijon Clones” Chardonnay from the same winery. The Carneros region is famous for producing “Burgundy-like” chardonnays, its climate benefits from cooling breezes from the San Francisco Bay and summer fogs are common. This particular wine is named “Dijon Clones”; Dijon is the historic and administrative capital of Burgundy. 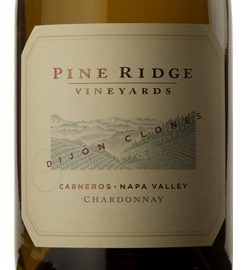 “Dijon clones” is the name of a specific clone of Chardonnay, a specific strand of the variety that was developed in Dijon and imported to the US in the eighties. The wine has a strong “fat” feel, with buttery notes that gives it a pretty strong body for a white wine. In this particular case it comes from the six months the wine spent “sur lie” (with residual yeast). I felt like it went a little overboard with it and that took the spotlight away from the primary aromas of the wine. On the plus side, it gives a very rich, lush body to the wine. The same aromas from the nose are there; especially the white peach and coconut notes from the oak can be tasted. Once again, they are a little overpowered by the buttery feel of the wine. Food pairing: I had a seared tuna sashimi with it which worked really well. I would try to pair this wine with sushi or very lean dishes to cut the slightly excessive buttery feel of the wine. Overall opinion: Worked really well with a fish meal, it’s a pleasant wine for a not excessive price, I feel it would be a little too overwhelming to drink by itself.